Working With A Limited Palette – Zorn palette | Paint. Draw. Blend. We recently worked with Enid Wood on a project for art educators. The theme of the project was “Working with a limited palette” based on The Zorn Palette. And we would like to share the exercises involved for you to try. First, here is some info. 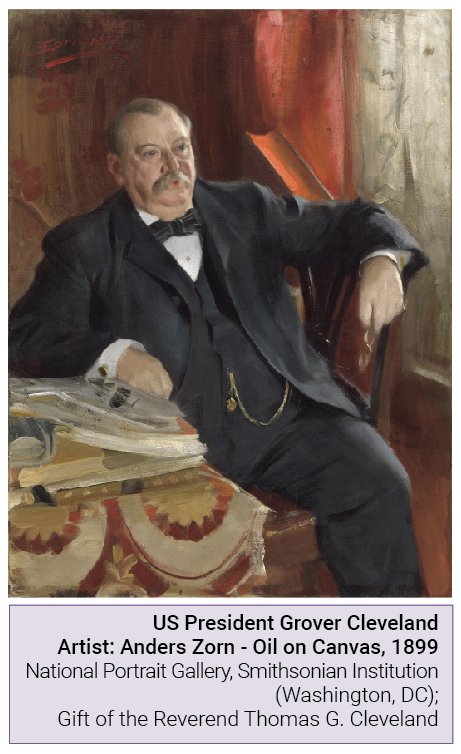 about Anders Zorn and his limited palette. The worksheets mentioned below can be downloaded here. For reference, finished examples are shown above. 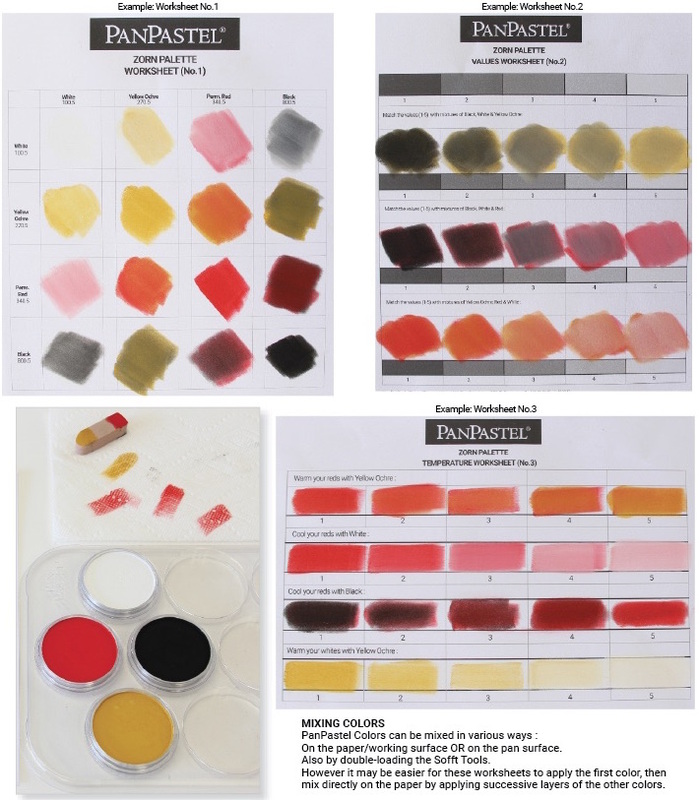 Begin by completing No.1 ZORN PALETTE WORKSHEET. Across the top & sides are the 4 colors. a) Add the colors in each of the spaces as indicated. b) Then add & mix the second colors indicated where the two intersect on the chart. Clean Sofft Sponge between colors on a paper towel. Use the different sides of the Sofft Tools for different colors. Observe how the colors change when each additional color is added & notice that all the colors created are harmonious. Color value is the relative lightness & darkness of a color. Dark values with black added are called “shades” of the color. Light values with white added are called “tints”. 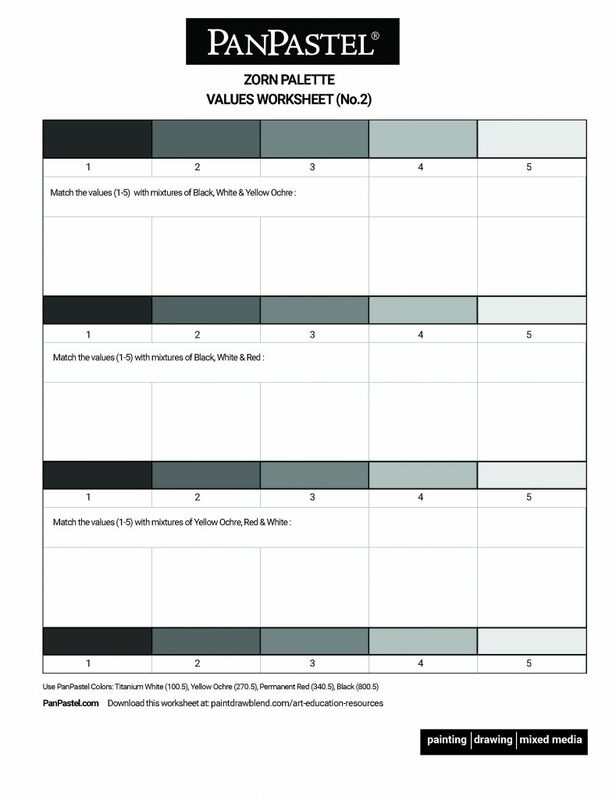 Complete the No.2 VALUES WORKSHEET with mixtures of 3 colors to achieve 5 distinct values of each mixture. (It usually works best to work from dark to light.). You will discover that changing the amount of black & white used enables control of the final value achieved. Next, complete the No.3 TEMPERATURE WORKSHEET by applying a single color across each row, then modifying it with a second color in varying degrees as indicated. Note: Warm colors are yellow and red. Black and white act as cool colors. a) Identify the lights & darks in the subject. In a small value sketch, paint the darks black & the lights white. b) Paint the same subject again, using yellow ochre as the dark, and adding white to it for the lights. c) Do the same with red. d) For the final painting – have the students look at the subject in terms of temperature: Cool the shadows with black. Cool the lights with white. Add yellow ochre to warm your lights as needed. Warm the shadows with red. 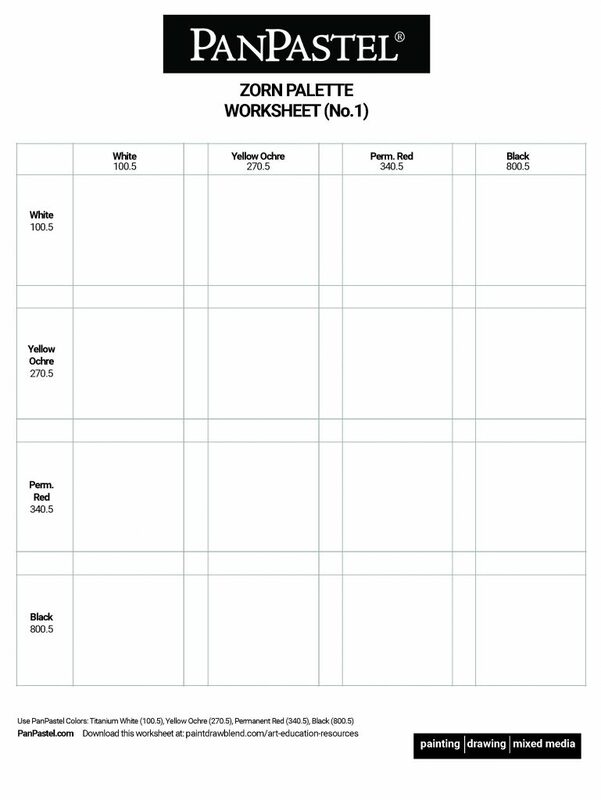 The worksheets mentioned above can be downloaded here. UPDATE Nov 20th – the giveaway winners are: Richard Kitchen, Debbie Brewster, Karen Murray, Vaun and Kathi Smith. Congratulations to the winners, and thank you to everyone who entered this giveaway. There will be another opportunity to enter a PanPastel giveaway soon. 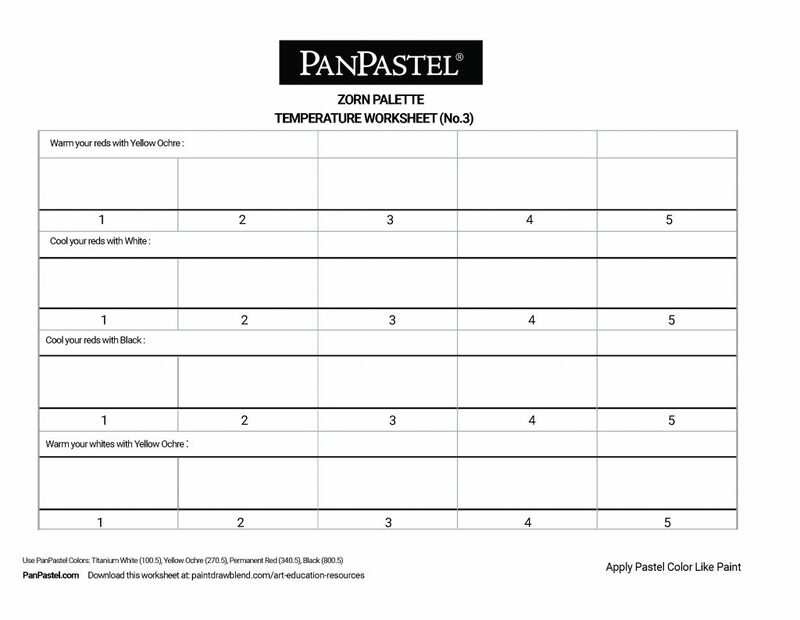 We are giving away the 4 PanPastel Colors featured above for the Zorn Palette exercises (100.5, 270.5, 340.5, 800.5). We will also include a palette tray to hold the colors along with our Sofft Tools Starter Set (Ref. 69102). Enter to win this giveaway using the form below by November 19th, midnight EST (New York time). FIVE lucky winners will be randomly selected. Winners will be notified by email. We’ll announce the winners on this blog and at our Facebook page.